While cupcakes require precise care (each small cake treated individually, coddled like a tiny babe in a bonnet of frosting), cobbler is a grandpa who still uses an old typewriter and gardens with a rusty shovel that shows its age. Cobbler doesn’t try to impress and doesn’t take special care to prepare, but the wisdom of its simplicity wins the hearts of all who encounter it. Tart raspberries, sweet brown sugar, the rustic appeal of oats, and the unique and earthy surprise of hemp seeds (if you’ve never baked with hemp seeds, read about baking with hemp seeds to learn more) makes this the cobbler to try as fresh berries make their first appearance at this summer’s farmers’ markets. 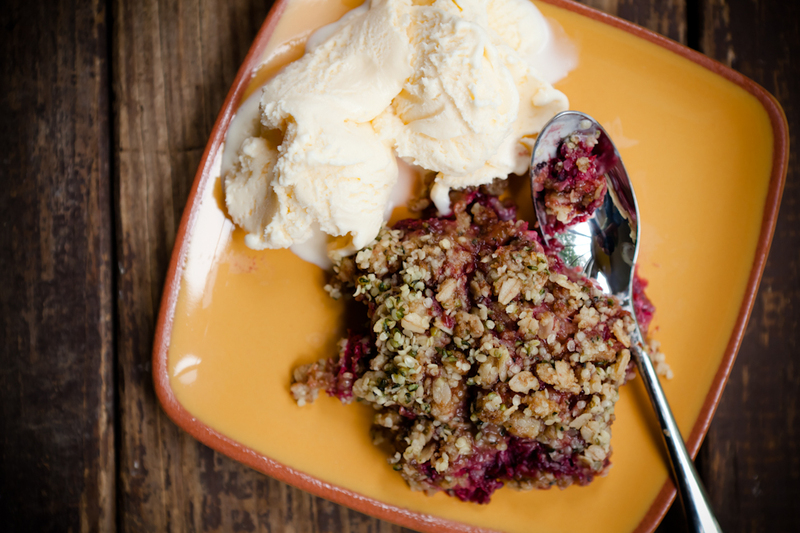 I created this cobbler recipe by modifying a recipe on Good Food for raspberry pine nut bars. 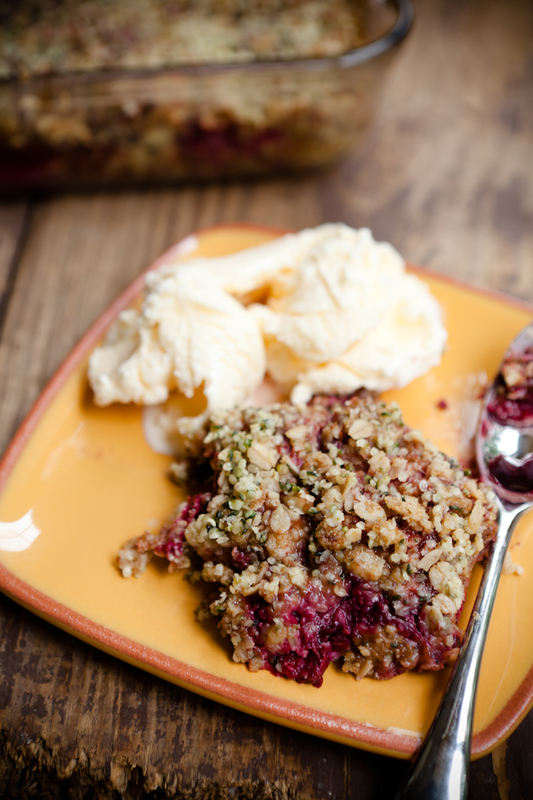 If you don’t have access to hemp seeds, I’m sure this cobbler would be fantastic with pine nuts. 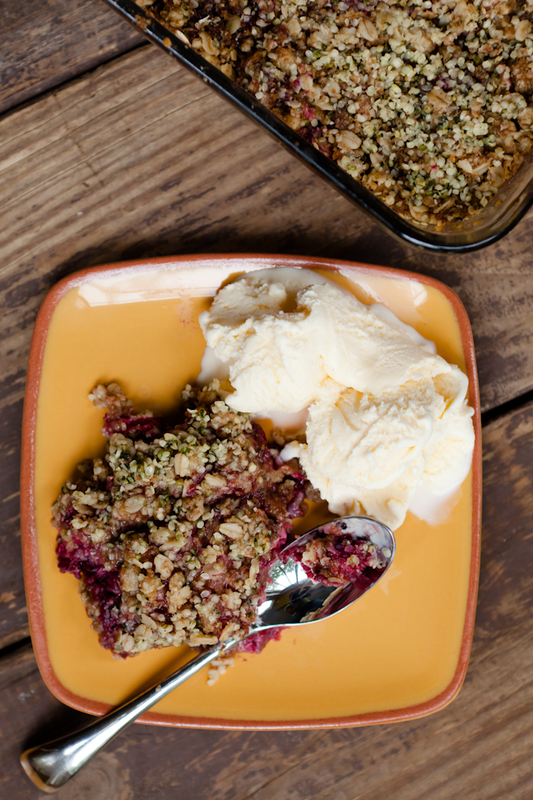 Tart raspberries, sweet brown sugar, the rustic appeal of oats, and the unique and earthy surprise of hemp seeds makes this the cobbler to try as fresh berries make their first appearance. In a large mixing bowl, mix the flour, oats, and butter until you have coarse crumbs. Mix in the brown sugar, lemon zest, and 3/4 cup of the hemp seeds. Use 2/3 of the mixture to evenly fill an 8" square baking dish. Spread the raspberries evenly over the filled baking dish. Top with the remaining third of the mixture. Top with the remaining 1/4 cup of hemp seeds. Bake at 350 F for 35-40 minutes or until the top is a golden brown.